Born in 1915, Robin Day was one of the designers who created a modern British style in the early 1950s. Like other designers of the time, he firmly believed that mass-produced furniture could be well designed and sold at affordable prices. He thought that this would improve the quality of life and bolster the optimism of a nation recovering from the Second World War. His earliest furniture designs were notable for their new forms and for the exceptional use of new materials. 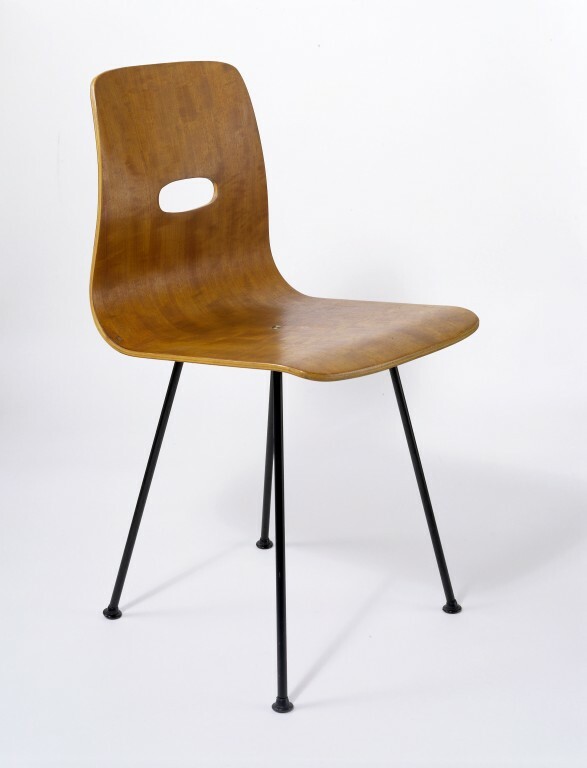 Robin Day’s modernist philosophy was shared by the British company Hille, with whom he has worked consistently since 1950. 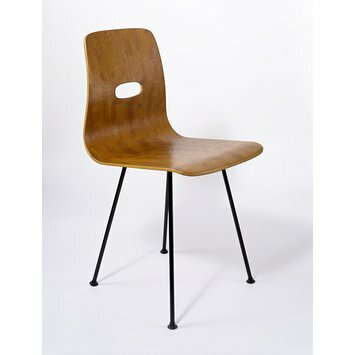 In 1953 he designed the Q Rod chair for Hille. This is made up from only two units: a single back and seat in one ply moulding that is bolted to a single metal leg frame. He designed the seat and back unit of the Q Rod chair to give correct support to the lumbar region of the back. Physiologists considered that this was vitally important to health and good posture, especially for anyone seated for long periods. This awareness of the emerging science of ergonomics was unusual among furniture designers at this date. Laminated wood seat and back with black painted steel legs.